We have scheduled a series of higher power flights for the next Perseus booster launches. Columbia is once again scheduled for this experiment. 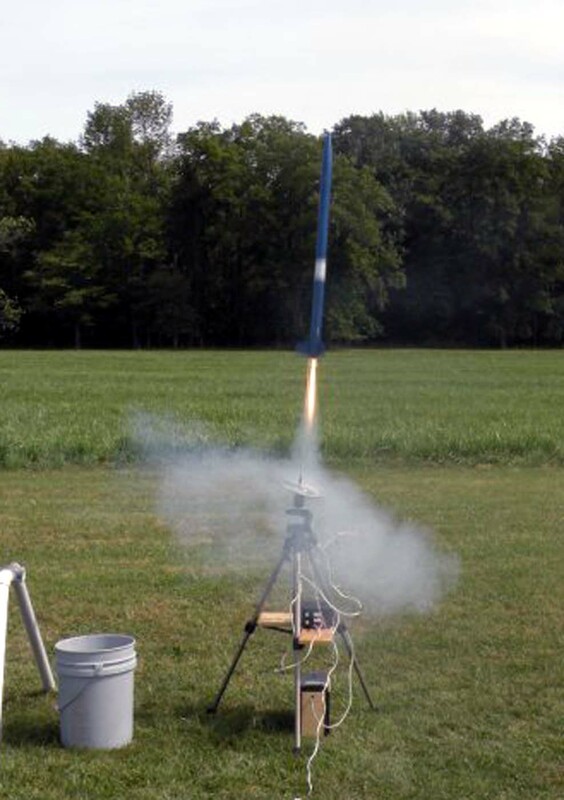 The launches will happen either at the Amherst field, or the O’Reily field – if the location ready for high power launches. If successful, Columbia should reach over 1700 feet. Columbia will be equipped with our on-board camera system as well as an on-board altimeter. The last two high power launches were less than successful for both Columbia on August 28th and test booster “X4-03” on September 11th. After several weeks of investigations, it was determined that both boosters were “hanging” on the launch rod just before clearing it – this caused the rockets to “whip” to one side. In the case of Columbia, nearly over-stressing its airframe, and for X4-03, causing it to fly in a complete loop before resuming upward. Perseus X4-03 lifting off at high power just before being whipped into a full 360 degree loop. The solution under test for the next mission involves much larger launch lugs, which will allow for a bit of “wiggle room”. Also, we will be using the E-18 motor vs. the E15 used last time. 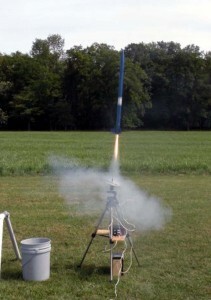 The E-18 has less initial “kick”, which should minimize any “wiggle” as the booster travels up the launch rod. The idea was tested on the last series of flights for Columbia, which utilized D15 motors. The D15 has very similar launch characteristics to the E-18. We feel confident that the Columbia will perform well on the E-18. This series of launches will bring us closer to the goal of flights above 2,000 feet using a dual deployment system currently under development. If all goes well, we may see our first dual deployment flight attempt by mid January 2011. We are starting the countdown for T- 6 days, 14 hours, 54 minutes. Weather forecast is so far calling for sunny skies, High of 60 degrees, 10 MPH winds. – Test flight missions with boilerplate dual deploy section as dry runs for high altitude dual deployment missions. – First dual deployment flights @ normal altitude. – First high altitude dual deployment flights. – Throughout the course of the above missions, flight video camera systems will also be tested. It will be a busy period of time coming up!